Nalaikh was once a major Soviet-era industrial hub, and the site of Mongolia’s first mine. Today, though, the town is littered with ruins of former factories, such as Mongolia’s only glassworks. Residents continue to work as freelance miners on the grounds of the former state-owned coalmine. But jobs are scarce in Nalaikh, as in every other small town across Mongolia. Despite rapid, mining-driven economic growth, Mongolia is experiencing persistent unemployment, a widening income gap, and a 30 percent poverty rate. The country’s leaders are now promising to diversify the economy, aiming to create jobs that push more people above the poverty line. Mongolia’s massive Oyu Tolgoi gold and copper mine started shipping copper concentrate to China in early July. By 2020, the joint-venture between Canada’s Rio Tinto, Anglo-Australian firm Turquoise Hill and the Mongolian government is projected to account for about 35 percent to GDP, according to Oyu Tolgoi’s website. Mongolia at present appears to be at high risk of suffering from so-called Dutch Disease, an economic condition in which a nation’s economy becomes overly dependent on the export of natural resources. Mining currently contributes about a third of GDP and accounts for 89.2 percent of the country’s total exports, according to data compiled by Oxford Business Group. But the sector employs only about 4 percent of the entire workforce. Inversely, the traditional agricultural sector – livestock for meat and wool – employs about 40 percent of the workforce and contributes less than 15 percent of GDP, according to the same data. The transition from a largely agricultural economy to one dominated by mining has contributed to disproportionate growth and exacerbated a problem in Mongolia, dubbed the “missing middle,” says Saurabh Sinha, senior economist at the United Nations Development Program (UNDP) in Ulaanbaatar. “On the one hand you have the mining sector which is running away and driving the entire economy and on the other hand you have the agriculture, the livestock and nomadic lifestyle. And between these two, the urban manufacturing sector is really scant and limited,” Sinha says. This wasn’t always so. Mongolia’s manufacturing sector comprised about a third of the economy in 1988, just before the collapse of communism. In 2011, the figure was 7 percent, according to Oxford Business Group. The decline, Sinha points out, is partly due to the collapse of many state-owned factories following the transition to a market-oriented system. He believes options for reviving manufacturing in the country are limited given the small population and poor infrastructure. President Tsakhiagiin Elbegdorj, re-elected for a second term in early July, has promised to promote economic diversification policies, but years of talk about the development of non-mining sectors have produced little, says Sukhgerel Dugersuren of OT Watch, a non-profit that monitors the impact of Oyu Tolgoi: “Ten years ago Mongolia started talking about economic diversification: improving its competiveness, developing the IT sector, developing eco-tourism.” But she believes the attention on mining has adversely affected growth in other sectors over that period. In April, Ulaanbaatar demonstrated its support for agricultural development with $86.2 million in soft loans for cashmere companies, garment industries and dairy producers. 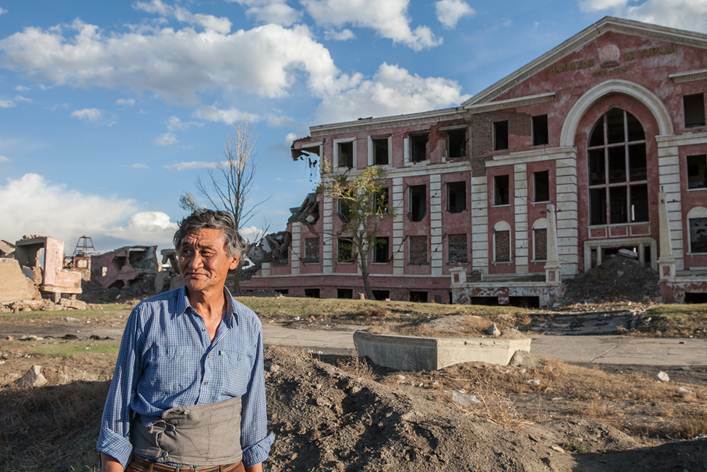 But limited private investment and scant infrastructure continue to check the agriculture sector’s growth potential, according to French entrepreneur and dairy expert Didier le Goff, who started a cheese factory on the outskirts of Ulaanbaatar in 2010. “Mining is fast money for a short time, agriculture is slow money forever,” says le Goff. He believes Mongolia has a unique potential to become an exporter of “organic bio-products” given the country’s nomadic heritage. But he admits sourcing local milk year round is difficult and enormous challenges still exist to rebuild and streamline supply chains in the vast country. A 2009 report from the UN’s Food and Agricultural Organization (FAO) noted that 70 percent of milk consumed in urban Mongolia was reconstituted from imported milk powder, despite a livestock population of over 30 million animals – or about 10 animals per every Mongolian citizen. Jim Dwyer, director of the Business Council of Mongolia, a private business lobby, agrees that developing the agricultural sector is Mongolia’s best bet to diversifying its economy. He argues the government must reinvest mining wealth in infrastructure and social services to generate broad employment. There are some signs authorities are listening. Earlier this year, Ulaanbaatar raised $1.5 billion in its first-ever bond offering. Though authorities announced plans to spend a large share of the money, about $850 million, on improving infrastructure across the country and to support the mining sector with construction of a new power plant and a new railroad, about $145 million was earmarked for improving cashmere production technology, dairy production and wool industries. “Agriculture is one thing we do have here. When the Russians left in 1990, the country was self-sufficient, even exporting various food products. There’s tremendous opportunity here with the [mining] money to bring that back to life,” says Dwyer.